(NEW YORK, New York – February 5, 2007) The Solomon R. Guggenheim Museum announced today that the recently recovered Francisco de Goya y Lucientes painting Children with a Cart (1778) will join the exhibition Spanish Painting from El Greco to Picasso: Time, Truth, and History at the Solomon R. Guggenheim Museum on February 16, 2007. 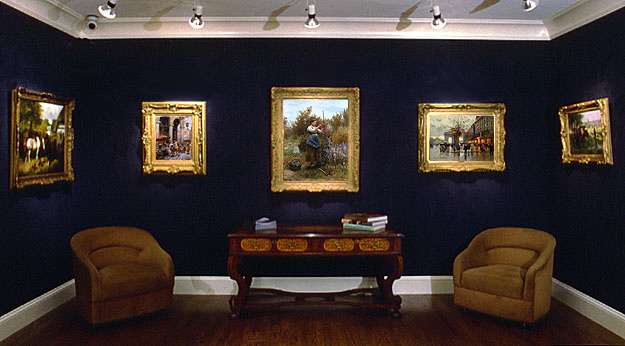 The painting was stolen in November 2006 while en route to New York City for the opening of the Spanish Painting exhibition. 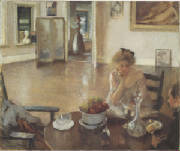 After an extensive investigation, the painting was recovered by the FBI and returned to the Toledo Museum of Art (TMA), where it was reinstalled on January 11, 2007. Spanish Painting from El Greco to Picasso: Time, Truth, and History remains on view at the Guggenheim through March 28, 2007. After the exhibition closes, Children with a Cart will return to the Toledo Museum of Art. An FBI investigation into the painting’s theft is ongoing. The museums have been asked to refer all media questions regarding the investigation to Stephen Siegel, Media Representative, Newark Division of the FBI, 973-792-3020. Art in New York City . The Asia Society presents Collectors’ Choice, an exhibition of cherished objects from the private collections of thirteen of the country’s leading Asian art collectors from February 27 through August 26, 2007. Approximately fifty extraordinary works of sculpture, ceramic, and painting from Bhutan, China, Cambodia, Gandhara (present-day Pakistan/Afganistan), Japan, Kashmir, India, Thailand and Tibet, which range in date from the second to eighteenth century, will be presented alongside selected objects from the Asia Society’s Mr. and Mrs. John D. Rockefeller 3rd Collection. The diverse group of contributing collectors to this exhibition include Renee and Robert Beningson Family, Susan L. Beningson, Mary Griggs Burke, Amita and Purnendu Chatterjee, Robert Ellsworth, Ron Lawrence and Julie Goodale, Andrew and Denise Saul, and Jane and Leopold Swergold. “We invited these dynamic art enthusiasts, self-taught connoisseurs and scholars of Asian art who live in the greater New York area to take part in this exhibition for the strength of their Pan Asian collections and also because of the diversity of ‘stories’ their lives as collectors could tell,” says Melissa Chiu, Director of the Museum, Asia Society. As a group, the thirteen collectors that have contributed their stories and collections to Collectors’ Choice represent a new era in the discerning collection of important art objects. “While exploring Asia does not have the exotic overtones it once did in the nineteenth century, today’s collectors face great challenges in locating significant artworks for sale and in taking risks on objects that need extensive conservation,” says Adriana Proser, Asia Society’s John H. Foster Curator of Traditional Asian Art who curated the exhibition in association with Kristy Phillips, Asia Society Museum Fellow. “In addition to years of refined connoisseurship, each of the collectors featured in Collectors’ Choice is known for having a practiced eye for beauty, authenticity, and a good deal.” The outstanding collections of Asian art objects on display in this exhibition reflect the controlled study, characters, individual experiences and fascinating chance encounters of these dynamic collectors. These top collectors together with the exhibition curators carefully selected masterpieces from the Asia Society’s Mr. and Mrs. John D. Rockefeller 3rd Collection to accompany pieces from their own collections. “Collectors chose pieces that they were drawn to and thought would work well, for one reason or another, with pieces from their own collections,” says Adriana Proser. “The Rockefeller pieces help to highlight pieces from their own collections and visa versa.” Amassed by John D. Rockefeller 3rd and his wife, Blanchette, and bequeathed to Asia Society in 1978, the Asia Society’s permanent collection served as a source of inspiration to collectors like Andrew and Denise Saul and Robert Ellsworth who have a similar passion for Chinese ceramics. Approximately 75 works from European and American collections showing the splendor of court arts from this vast empire. Organized by the City of Paris, Musée Cernuschi and Paris Musées in association with Asia Society. Curated by Françoise Demange, Musée du Louvre. Curatorial consultants, Prudence O. Harper and Michael Chagnon. Yuken Teruya’s first solo museum presentation which includes a newly commissioned installation inspired by a Ming-dynasty Chinese porcelain jar selected from Asia Society’s Mr. and Mrs. John D. Rockefeller 3rd Collection. Curated by Miwako Tezuka, Assistant Curator, Asia Society in association with Yang Yingshi, Asia Society Museum Fellow. Asia Society is the leading global organization working to strengthen relationships and promote understanding among the people, leaders, and institutions of Asia and the United States. We seek to enhance dialogue, encourage creative expression, and generate new ideas across the fields of policy, business, education, arts, and culture. Founded in 1956, Asia Society is a nonpartisan, nonprofit educational institution with offices in Hong Kong, Houston, Los Angeles, Manila, Melbourne, Mumbai, New York, San Francisco, Shanghai, and Washington, D.C. The Museum is open Tuesday through Sunday from 11:00 a.m. – 6:00 p.m., Friday from 11:00 a.m. to 9:00 p.m. Closed Monday. General admission is $10, seniors $7, students $5 and free for members and persons under 16. Free admission Fridays, 6:00 to 9:00 p.m. 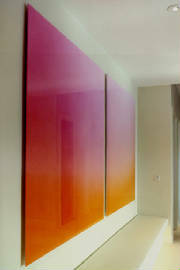 The " PINK PROJECT, is a study in the notions of " PINK" merging of colors into spectral horizons. This exhibition runs through March 3rd in New York. Works from her series will also be shown in a group at Houston Center for Photography, Texas, in April 2007 at the Museum's 25th year anniversary entitled Antennae. The Pink Project will also be shown as a one person exhibition in September 2007 at both Bjorn Ressle Fine Art and Houston Center for Photography. Anne Katrine Senstad works with light, color and sound. When creating photographic light and sound landscapes, she seeks to capture colors and light that are present in a space, transforming these elements to a visual language. Working initially with installation pieces and music, she also draws inspiration from the history of abstraction, architecture, installation art and sculpture. Senstad has exhibited widely internationally, including the Architectural Museum in Sao Paulo and Gary Snyder Fine Art in New York. Her first major solo show was held at Galleri JMS in Oslo, Norway, 2002 where she showed the Light and Color series. She was born in Oslo, Norway, and lives and works in New York. Group show including artists Anne Katrine Senstad, Yves Klein, Sol Levitt and more. A brunch reception for the artists will be held Saturday February 24, 11 am - 2 pm during the Armory show. Ithaca Night Life ( NightLife ), NY - Art Galleries ..
New York City Art, Artists, and Art Galleries News Archives.